Some of The Friends of Matheny officers for 2013-2014 gathered outside the Roxiticus Golf Club after their luncheon. 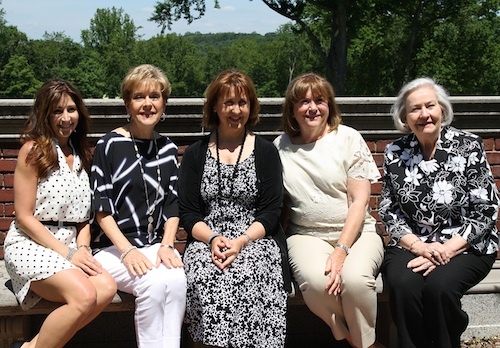 From left, Lisa Novella, a resident of Peapack, corresponding secretary; Nancy Hojnacki, Bernardsville, vp membership; Liz Geraghty, Cranford, president; Karen Thompson, Gladstone, vp membership; and Jean Wadsworth, Basking Ridge, recording secretary. The Friends of Matheny held its annual end-of-the season luncheon on June 5 at the Roxiticus Golf Club in Mendham, NJ, and Friends president Liz Geraghty handed Matheny president Steve Proctor a check for $60,000. The Friends is an organization dedicated to providing support to Matheny, and, since its inception in 1983, the group has raised more than $3 million. Proctor thanked members for all they do, singling out such gifts as an adaptive bathtub and a new “Van Go” vehicle, which will help bring Matheny’s unique Arts Access Program to other facilities for people with disabilities. I am a parent whose son has been at Matheny for over ten years. I am always impressed by the amazing dedication these lovely ladies have for Matheny children and adults. I can always find a touch of generosity and love from them throughout the school and living areas. The delicious holiday treats, snacks at events, or just a smiling face can do wonders, especially when we travel over two hours to get there. We know that our child is shown love and compassion even when we aren’t around to give it to him ourselves. They show us that our kids our worthwhile and deserving of some of the special things in life. Whether you are behind the scenes or right out there, you are appreciated. Thank you Ladies!